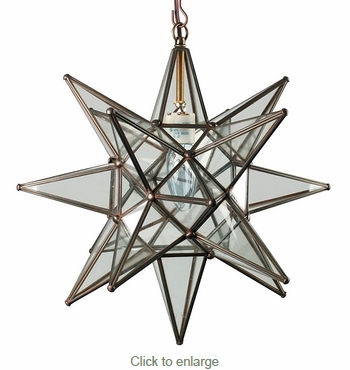 This elegant clear glass star light will illuminate your decor and enchant all who enter your home. These hanging star lamps are all handmade by talented craftsmen in Mexico to bring an authentic rustic appeal to any room in your home. A Mexican glass star lantern will complement any Tuscan, Spanish colonial, southwest, or Santa Fe style decor.